A strong will and a certain amount of courage is needed to drive in Ireland, since they drive on the wrong side of the road there. They think it's the right side, but it's actually the left. I know confusing right? 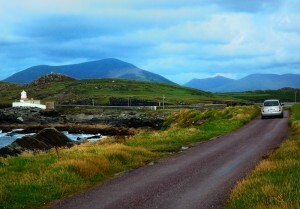 Still, since driving your own car is hands down the best way to see Ireland, it's worth the trouble. Just remember that while it’s good to have a plan, it's best to not have a real set schedule. Schedules can kill a vacation, especially in a country where many of the roads are one lane in either direction with no separation between them. Some roads barely seem big enough for two cars to pass each other and as you settle into the monotony of driving you might find yourself drifting to the side of the road you're most comfortable with. In addition to this there are also many obstacles that at times you feel like you're playing a video game. 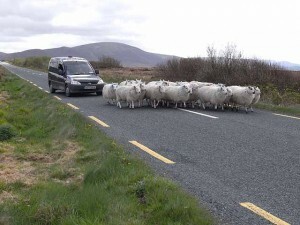 There is a popular Irish postcard with the caption ‘Traffic Jam’ which shows a car in the middle of the road surrounded by either cattle or sheep. This postcard is only funny when you see it in the airport before you’ve driven on country roads. After a few days in the country it seems more like a cautionary tale. Just relax, take some pictures and file the story away to get you a free beer in the pub next St. Paddy’s day. Another thing to remember is that your car, and everyone else’s, has side mirrors. Yes side mirrors are a given, unfortunately they are also an accident waiting to happen. Especially when you drive through a busy Irish town with cars parked in the street on both sides. I’m not saying I ever took off someone’s side mirror, but if I did, I swear I went back and offered to pay for the damage. Another important thing to remember when driving in Ireland is that most of the drivers live there and are familiar with the roads. True driving 65 mph on a mostly unpaved road that’s barely big enough for a car going in one direction may not seem like a good idea, and it’s not, but familiarity breeds complacency. Just get the extra rental car insurance and don’t worry about all the scratches on your car from hugging the bushes on the side of the road. I have driven in Ireland a few times, most recently when my dad had to go to visit various family members that only my aunt knew. That situation brings me to my last piece of driving advice. If you ever need to follow someone who is the only link between you and where you need to be, all bets are off. Do whatever you need to stay with that car. Also since all cars look the same in Ireland, you probably want to write down the license plate number. Otherwise you may realize that the car you were following was just some guy on his way home from work. And while the Irish are a hospitable bunch, they probably won’t invite you in for dinner and to stay the night. Have you any experiences of driving in Ireland? Visited other parts of Ireland? Do you have any advice or recommendations for our readers? As I walked through the rain to the bus stop, after a quick check-in at the Brú na Bóinne Visitor Centre, I found myself wondering if the sight at the end of this trek was going to be worth it. As I hiked across the wooden bridge and down the path, water seeping into my shoes, I was tempted to turn back. This feeling deepened when I reached the bus stop and found I was the only person there. 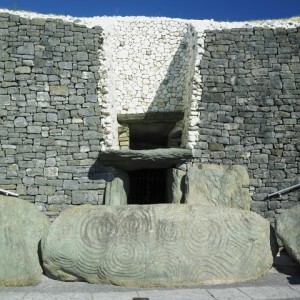 This visit to Newgrange was an anomaly on my mostly unplanned trip around Ireland. Everyone I talked to had raved about Newgrange, so I had made special plans to visit the sight. Still, as I stood there in the rain waiting for the bus that would (hopefully) take me to the actual tomb, I wondered if like so many ‘must sees’ Newgrange would be a disappointment. There is something magical about Ireland that makes you feel as though its years of history connect seamlessly to its present. I had seen a lot of that history as I followed rambling country roads through small towns. I had walked by stone walls that themselves dated back hundreds of years. The stones used to build the wall may well have come from ancient ruins that went back even farther. That may sound farfetched, but a building project is how Newgrange was rediscovered in 1699. Charles Campbell had instructed his laborers to dig into what appeared to be a large mound of earth. He was hoping that they would unearth stones he could us for building materials. 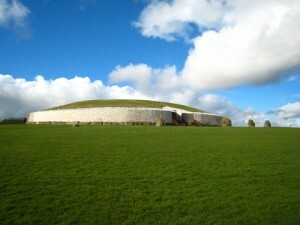 Instead, their digging they uncovered the entrance to the main passage tomb at Newgrange. Newgrange was originally built around 3200BC and at some point the tomb was sealed and the location forgotten. Like many of Ireland’s historical sites, Newgrange was not closed up and carefully monitored until more recent times. This ease of access led to one of the more interesting aspects of Newgrange; the graffiti. I find myself fascinated by what one Newgrange website referred to as an act of "evilly-disposed visitors”. It's hard to believe that people would actually write the 17th century equivalent of Kilroy Was Here on the stones of an ancient temple, but they did. We think of this as a modern problem, but the dates by some of the names and comments on the walls of Newgrange show that people in the 1700’s and 1800’s apparently felt a similar need to make themselves known. Still, perhaps the most intriguing fact about Newgrange is one that would have first become apparent to archeologists on the Winter Solstice. On that day each year, the sun’s light shines in through a hole above the entrance and lights up the interior for about 17 minutes. Obviously this makes the Winter Solstice a very popular day, so the 100 spots are given out by lottery. Don’t feel bad if you can’t make it to Newgrange that day. Towards the end of each tour, the entrance is closed and a light shined in to give visitors an approximation of what the tomb is like on Winter Solstice. As I stood there in the dark and watched the light that mimicked the sunrise slowly seeping in, I smelled the years-old earth and felt a sense of peace and wonder. I also thought to myself that yes, it was totally worth it. Have you traveled to Newgrange? Visited other parts of Ireland? Do you have any advice or recommendations for our readers? 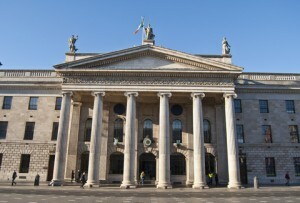 Dublin Ireland is an amazing city. Some people will laugh at those bus tours that take you around a city with a hop on hop off format. I swear by them. It’s one of the best ways to see all of the tourist type parts of a city. One reason this is so great is because sometimes tourist sites are not always easy to get to or in a great area of town. Plus tours like this give you an idea of the layout of an area while letting you see what you want to see the most. Dublin is no exception, their bus tour lets you visit both the Guinness Museum and visitors’ center whose tour appropriately ends in a bar or if you’re interested in something harder you could go with the Smithfield Whisky tour. If you aren’t a drinker at all, you could visit a Museum or two or stop at Trinity College to view the book of Kells or slip over to Temple Bar from there to lift a pint in one of the many pubs and restaurants. Or if you’re like me, you can slip into an audition for Ireland’s next pop music divas and lie your way through the first round only to realize that at nearly 27 years of age you’ll never be able to pass as 18. Who knows, maybe you’ll be more successful than I was. After all, Dublin is a city of magic. Except for the more far flung sites that were the reason I recommended taking the bus tour first since it gives you an overview. The city is really a very walkable city. This is because, at its heart, Dublin is a people’s city and the best way to see it is to be right in the middle of those people. As cosmopolitan as London or New York, you’ll hear many languages spoken with many voices. Just being out in the throngs make you feel alive. Maybe you’ll stop in at the O’Connell Street Post Office and wonder for a moment what the holes are in the façade? These small holes are actually bullet holes form the Easter Rebellion in 1916. To an American whose own country’s war for freedom from the Brits was so long ago it is almost like revisiting your own past. It will touch you; this sign of Ireland’s more recent fight for independence, a fight some Irish will tell you was only half won. Ireland’s fight for freedom is still noticeable in her music. Whether you’re listening to an older band like The Clancy Bros. or an Irish Band punk band like Flogging Molly, who currently reside in LA, you hear both a love of country and yearning for something… If you’re lucky enough to step in to a pub on the right night, maybe you’ll find your own band like I did with the Three Toms, they play traditional Irish music with an influence of Johnny Cash. 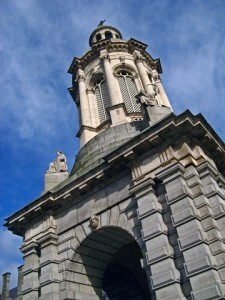 Finding something that feels like yours comes naturally when visiting Dublin. Maybe you’ll find your band, or perhaps it will be a place. Will your place will be a hip pub in Temple Bar or an out of the way restaurant or sweet shop on Grafton Street. It could even be St Mary's Pro-Cathedral. Dublin is an easy city to make your own. It is also a very hard city to leave. Oh and before you do, leave that is, go up to the tearoom on the top floor of Cleary’s Dept store for a spot of tea. It’s where my Grandfather Bartle would take my dad Jim whenever he came in to see him at Belcamp, the Catholic School he attended in the city. It’s kind of a tradition and despite all of the hustle and bustle of the new and modern Dublin, tradition is still something that matters a lot both to Ireland herself and to her people.